Every month we select and summarize what we feel are the most interesting civil cases emerging from the B.C. Court of Appeal (B.C. Edition), and the Alberta Court of Appeal (Alberta Edition). These are opt-in-only newsletters. 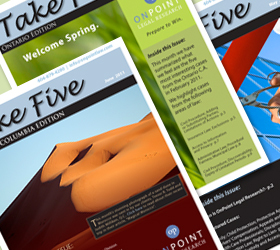 We have recently added a new feature to both editions of Take Five that is proving popular with our readers. Counsel Comments enables counsel involved with our selected decisions to provide their comments on the decisions, whether to highlight important legal changes, provide thoughts on appeal prospects, or to comment on any other aspects of the cases, as they see fit. We also regularly feature articles by leading legal professionals discussing interesting current legal issues. If you would like to submit an article, please contact us for further information. We will not use your email address for any other purpose, and you can unsubscribe whenever you wish. Law firm wanting to accept referrals or notify other lawyers about your areas of specialty? Legal service provider looking to increase exposure? The B.C. version of Take Five is sent to over 2,000 lawyers in B.C. and hundreds more in Alberta and Ontario who have contacted us to sign up to receive our monthly newsletter. The Alberta edition is sent to over 900 lawyers in Alberta who have opted in to receive it and hundreds more in B.C. and across Canada. To view our B.C. Media Kit, please click here. To view our Alberta Media Kit, please click here.